The next French envoy to the Holy See has been chosen after Roman Catholic officials rejected the first candidate because he is gay. AFP reports that another candidate was rejected because he is divorced. The rejected gay candidate, Jean-Loup Kuhn-Delforge, is in a civil pact with his partner and is a career diplomat. The Pope visited France last month and was happy to be received by President Nicolas Sarkozy and Carla Bruni, who divorced his first wife to marry Ms Bruni. France’s ambassador to Moscow, Stanislas Lefebvre de Laboulaye, will take the Vatican post. 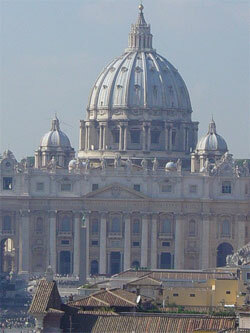 The Holy See, which governs the Vatican City and represents the Roman Catholic Church, sends ambassadors to countries and international organisations such as the UN. Nations have sent ambassadors or envoys to the See since medieval times. The Roman Catholic Church is opposed to gay rights and any attempts to protect or recognise gay relationships in law.